In the early 1970’s, Porsche’s new model cupboard was empty and the feeling inside the company was that they needed to have a more modern and robust product pipeline. Also in the back of the minds of Porsche engineers was Ralph Nader’s crusade against a car with a very similar design to the 911—the Corvair. Like the 911, the Corvair was air-cooled with the engine mounted behind the driver. 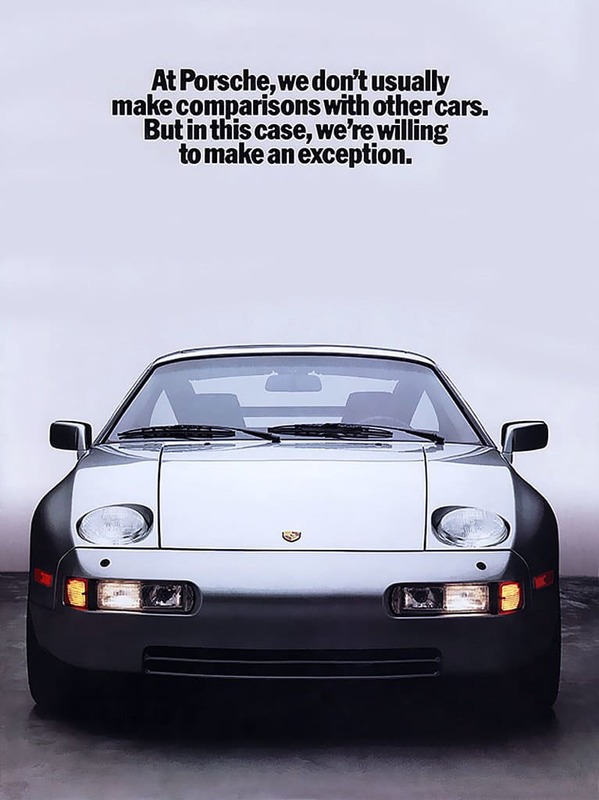 The idea for the 928 was hatched in 1971. However, a production version of the car was not ready until the 1977 Geneva Auto Show. 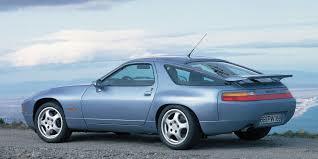 Porsche started selling the 928 as a 1978 model. The 928 was initially intended to replace the venerable air-cooled rear-engined 911—but thankfully that never happened. The 928 was as different from a 911 as you could get. The car was designed with a front mounted liquid-cooled V8 that was coupled to a rear transaxle—the transmission, differential, and axle were all combined into one high-tech unit. Styled by Wolfgang Möbius, the 928 looked radically different from anything on the road in 1978. It had a bulbous shape, and the body colored bumpers were seamlessly integrated into the overall car. This design gave the 928 a very modern and futuristic look. Critics argued the 928 shared a mild resemblance to the AMC Pacer. A testament to its design creativity, when production ceased in 1995, the Porsche 928 was still a very distinct car. During its seventeen-year production run, no other car looked anything like a 928. The 928 was a technological tour de force and was loaded with advanced features and liberal use of aluminum. The car also had the revolutionary “Weissach Axle” which enabled the rear wheels to steer while braking into a turn. Even the instrument cluster was a blending of art and technology. Adjusting the steering wheel up or down moved the entire instrument pod which enabled an unobstructed view of the gauges at all times. For years, the 928 held the coveted title as the most expensive Porsche in the product lineup. Each iteration is a spectacular and comfortable car to drive. Despite all the technology, refinements, and accolades, the 928 remains the red-headed stepchild of Zuffenhausen. Most “real” Porsche aficionados pay little attention to the 928 and valuations reflect this fact. Today you can buy an early-generation 928 for a fraction of the cost of a 911 of the same vintage. Even low-mileage pristine examples (if you can find them) do not command a huge premium. In the used car market, 928’s faced a steep depreciation curve, and as a result, few have survived in investment grade condition. 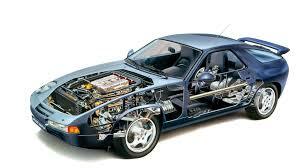 The 928 is a complex piece of German engineering, and it requires care and feeding. Eight years after leaving the factory most of these cars were neglected because of the high cost of maintenance. The 928 was an expensive car to buy and a very expensive car to maintain. In its final and best iteration, the 928 GTS sticker price soared well past $100,000 making it among the most expensive sports cars sold in the United States in 1995. Throughout its seventeen-year production run, the 928 enjoyed incremental annual improvements. Horsepower was continuously increased, the bodywork was refined (spoilers, wings, and side skirts were added), and in 1990 the 928 got a new differential that was based on a design used in the 959 supercar. This uniquely German evolutionary process improved the 928 every year until production ended in 1995. While 928’s are not collectible cars, I submit that the final edition GTS version will gain significant market respect in the coming decade. The 928 GTS is already starting to see an increase in value. Why? The car is simply amazing. It’s fast, its comfortable, and it’s comparatively rare. It also turns heads—even today. Only 400 GTS’s made it to North America between 1993 and 1995. In total, less than 3,000 GTS’s were ever produced. The 928 GTS is distinguished by its larger brakes, larger motor (350hp), and aggressively wide rear fender flares. The rear wing was painted body color and the so-called “cup mirrors” give the car a more rakish look. Last year I bought a gorgeous black-on-tan GTS. My car is a one-owner automatic GTS with 28,000 original miles. Manual transmission examples are now trading for six figures because of their rarity. The majority of all 928’s were sold as automatics, and this was especially true with the final edition GTS model. 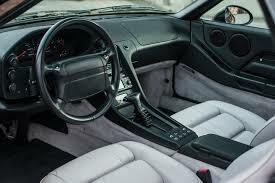 Personally, I think the 928 was always meant to be born with an automatic. It is a grand touring car, and the lack of a clutch suits its mission as a German cruise missile. Put the 928 GTS on your watchlist—investment grade examples are positioned to dramatically appreciate in the years ahead. 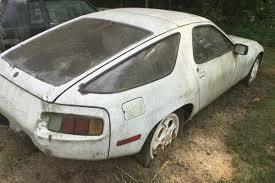 How most 928’s were stored and cared for….